Hey fellow LJ and LJettes’ Check out this website. Tommy MacDonald is now making some great looking stuff available to us via the internet. 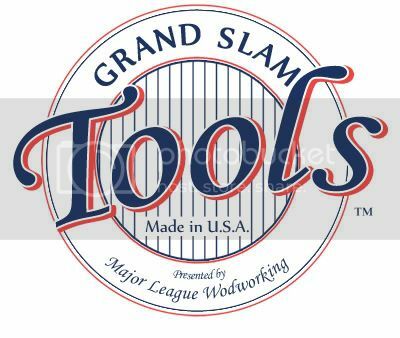 Right now you can purchase his “Home Run 4 Pack” and “Major League Woodworking” T-shirts. More high quality items are sure to follow. The 4 pack includes a ‘bench bat’ of hard maple, two, yes TWO marking/paring blocks (Both 1:6) that will help you lay out and hand cut sweet dovetails, and a sleek marking gauge with a finely honed Hock blade. The marking gauge is available in the classic hard maple and the exquisitely rich dark browns of REAL ebony. Be the first wood worker on your block to take them for a test ride. Hey, Don’t forget , you can go out on the town with you wood working significant other, sporting one of his crisp looking MLW T-Shirts. 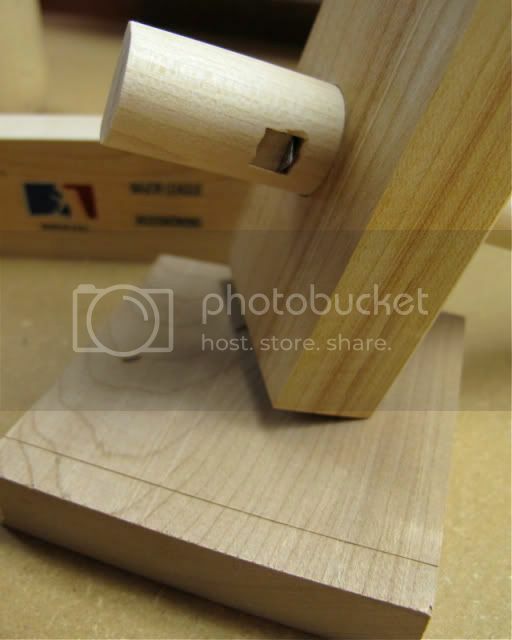 GLOAT WARNING: The picture I posted shows the maple marking gauge. Tommy called me and told me my Home Run 4 Pack with the Ebony Marking gauge and two shirts are on the way to me here in Florida…. Hey guys…. Just spoke to Tommy and he said mine should be here tomorrow. I will post pictures of the set soon after they get here. Have a great day in the shop.. CHOP CHOP!! Last time I suggested Tommy should sell videos he said he didn’t want to go commercial like some other well know woodworkers. I think he’s a great woodworker with very high standards. I hope he sells a million sets. I’m holding out for the Bombay or other Videos. I hope to receive my set this week. I’ve forgotten far more out of T’s website videos than I could ever afford to pay for on my own….this is a great deal. besides being a great woodworker he’s done a lot for the whole comunity we should help him help us. 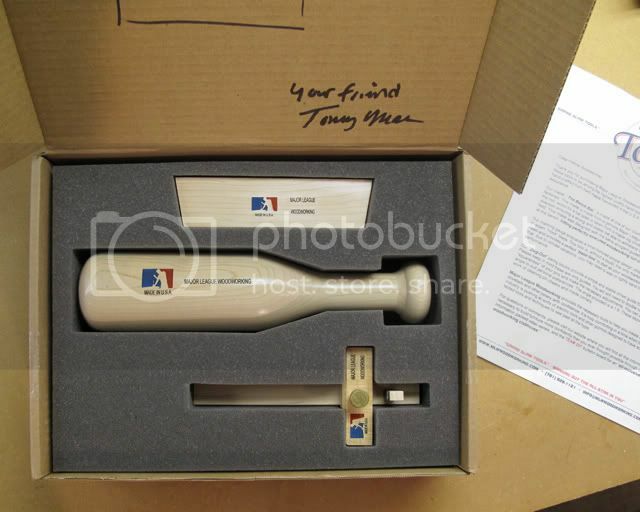 oh, I SO need a bench bat, and a new T.
I’m glad to see Tommy making a go of it, no matter what he’s building and selling. A go gitter IM old HO. 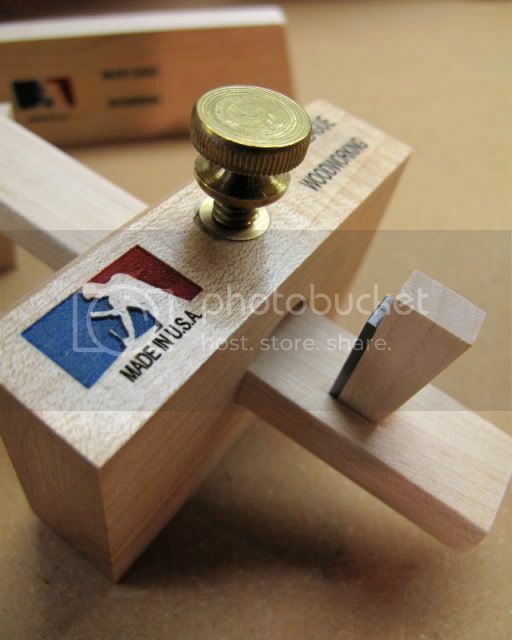 I can’t decide which I like better, the bench bat or the marking gage. The bench bat is really heavy for its size which saves your arm a lot of work. It is much denser than any other chisel mallet I ever used. The marking gage is also great with the Hock blade. Before this I used those stupid gages with the round pinpoint that did nothing more than tear out a scratch on the wood. This marking gage cuts a nice line to get your chisel into. The price is good for the high quality of the products and I think supporting Tommy’s business is good payback for all the great education stuff he supplies for free. Hey guys, I just got a very cool package dropped off on the front porch. 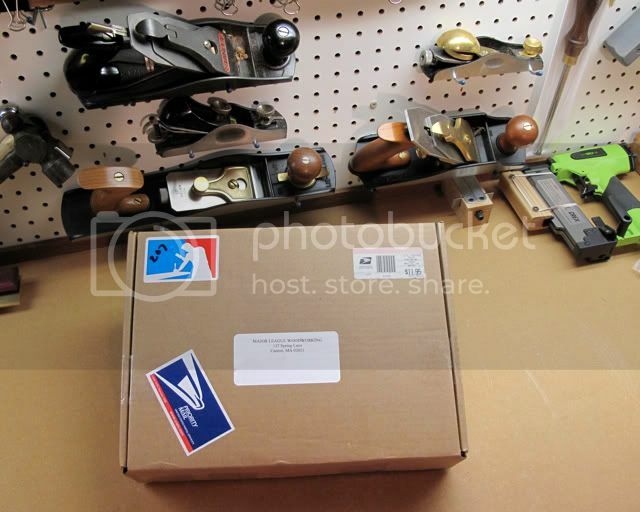 I’ve been waiting anxiously ever since placing my order when I first heard these tools were in production. Knowing Tommy I knew this would be a quality set. I must say I am not disappointed! The custom packaging makes for an absolutely excellent presentation of this custom-made tool set. 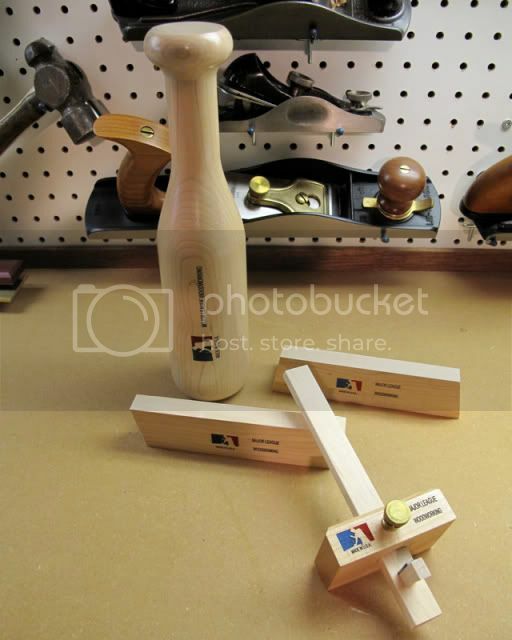 The “dugout” paring blocks (1:6) are the perfect size. The maple mallet is awesome with tight, dense grain that is well turned and exquisitely balanced. The mallet is turned from an actual major league hard maple baseball bat billet at the premier major league bat manufacturer right here in the USA! However, the marking gauge, well it is in a class of its own. It is light but yet has a solid feel. The gauge bar slides so smoothly and the blade is wicked shaaarp! I had to quickly remind myself to NOT run my thumb along the blade as I was admiring the marking gauge. This marking gauge works perfectly right out of the box! Great follow up. I used my ‘ebony’ marking gauge this afternoon with similar results. Tomorrow I will use the bench bat when I do a little mortise chopping. No need to say that I am jealous of the ebony gauge! I say that on Tommy’s website and it is beautiful. I like the stainless steel thumbscrew in contrast with the ebony. Congratulations! I am glad you are using it and not resigning it as a “looker” and not a “user”. I learned a long time ago that TOOLS are just that. Only ART is to be put on a shelf and admired. Although I have to admit that Tommy’s 4 Pack is a work of art, they remain tools and will be used with joy and hopefully some precision. David-good pictures. I’m really bummed because after opening my pack today, I went out and shot a video so people could compare the size and proportions of the mallet to some store bought mallets. The recording had a problem and the family obligations kicked in so I didn’t get it done. To some, the pics make the mallet look like it might be lightweight, but it has the heft of my best purpleheart mallet and is very manageable. I was impressed by the laser engraving too since I expected to see surface painting. I wouldn’t have cared at all if the tools came without any decoration. I use my tools-I don’t sit around admiring the look of them usually :-). Anyway, I tried it out with large chisel and found that the mallet was good at controlled light tapping like when chopping dovetails as well as taking full power smacks like when going for rapid stock removal. This thing definately isn’t the bat night baseball bat I was expecting to see. As far as the marking gauge, I tested it against my brass marking gauge with the micro adjust feature (no names to bash, but its the expensive one I got from a company on the east coast as well as a traditional Stanley marking gauge from years gone by and I honestly like the performance of this new marking gauge much better. Part of the reason is because the blade in this thing leaves a crisp well defined marking line compared to the brass one, plus I never noticed this before, but the traditional style gauge enables me to have a lot of leverage right over the cutter compared to the TiteMark which wants to wander. The stanley is a joke compared to both. I was thinking about buying a traditional marking gauge for a while and I’m glad I waited because the hock blade in this gauge makes it work well. I also like how the locking knob works on it compared to other marking gauges I’ve seen. The lock bolt presses a piece of material into the shaft of the tool so it doesn’t leave impressions and is going to continue working the same over time. I haven’t tried the paring blocks yet, but I can see how these will come in handy when I need to produce furniture grade dovetails and don’t want to live with pins left with rough sides straight from the dovetail saw. For about $100, this is a good deal and would make a good gift also for someone interested in getting into woodworking. Got my prize today…..No doubt it’’s a sweet set o’ tools….Honestly, I don’t think I could make a better set if I wanted to….... this is the real deal for those on the sidelines. I’ll be posting some upgraded Dt’s soon. I was very anxious about the bat. I’ve been using a dead blow hammer since my jump to hand cut dt’s and been eagerly awaiting the purchase. All I can say is that it’s perfect…....great balance, rock solid strikes, and a comfortable size….Great job T.
pablodomingo…..thanks for sharing your video.